A new film adaptation 鬼吹灯天星术 of the Ghost Blows Out the Light novels series has been announced, and marking the book characters return to the big screen are Zhang Hanyu, Jiang Wu and Celina Jade. Zhang Hanyu will take the role of Hu Bayi, a former soldier who became a tomb raider after inheriting a book on tomb configuration from his family. Jiang Wu will play Wang Kaixuan, Bayi’s former comrade in the army and good friend. Celina Jade is cast as Shirley Yang, an American-born Chinese and photographer for National Geographic. The golden line-up coincidentally had a date with Hollywood with Zhang Hanyu in The Great Wall, and Celina Jade as Shado in the CW series Arrow. The previous movie adaptations got mixed reviews due to too many changes from the original plot, but it'll be interesting to see how the new cast will be received. Ghost Blows Out the Light is a series of books written by Zhang Muye in 2006. It follows the story of Hu Bayi and his partner in crime, Wang Kaixuan as they raid tombs in search of riches. The duo will seek clues among ancient mythical sites across China together with Shirley Yang. The novel formerly had two movie adaptations released in 2015 and three television adaptations released from 2016 to 2018. Uh... Wasn't Jiang Wen (his brother) the one in Rogue One? 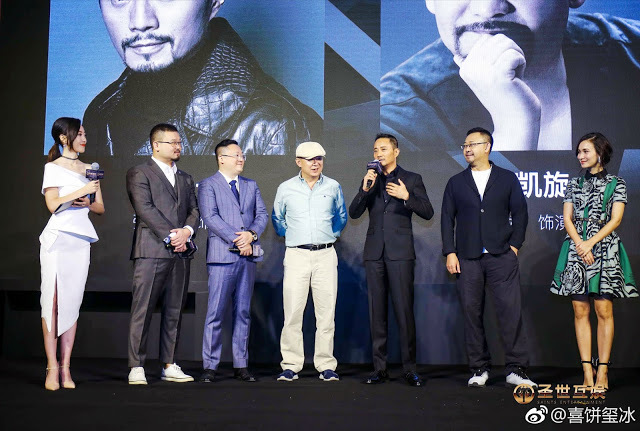 Lol good catch.. jiang wen jiang wu..